Pathologists currently use 20th-century technology—slides and microscopes—for cancer diagnosis. Digital pathology (which can be simply defined as the management and interpretation of pathology information in a digital environment) offers tremendous potential to improve workflow, interpretive accuracy, and sharing of information. Rather than sending an actual glass slide from doctor to doctor, a digital file is sent. Digital pathology is gaining significant momentum. It provides ready access to high-quality slide images, enables better and faster diagnosis, and offers a means to preserve these digital slides for future reference. Advantages of digital pathology systems also include the development of advanced image analysis tools that can provide more personalized treatment plans. Yet there is no US Food and Drug Administration (FDA)-approved digital pathology system for clinical use. Back in 2008, the University of Pittsburgh Medical Center and GE Healthcare partnered to create Omnyx, with the aim to create a digital pathology system approved by the FDA for clinical use, bringing cancer diagnosis into the 21st century. Now, Omnyx could be closing in on this goal (see below). In a new analysis, BCC Research finds that globally, the digital pathology market is expected to grow at a five-year (2015–2020) compound annual growth rate (CAGR) of 15%, reaching about $6.5 billion in 2020 from nearly $3.2 billion in 2015. Regionally, North America dominated the market with approximately 40% market share in 2014. Various government initiatives in this region for digitization of healthcare data are major drivers. However, Asia should register the highest five-year CAGR (21.8%) during the forecast period. A rapidly increasing volume of patient data from rising medical tourism in Asian countries such as India and Thailand is driving this market. Growing awareness among Asian consumers about digitized healthcare systems is also fueling demand. The need for transformation in healthcare delivery models and a growing demand for greater-value care are driving the adoption of cloud-based healthcare models. These emerging trends are expected to bring immense opportunities to the digital pathology market. 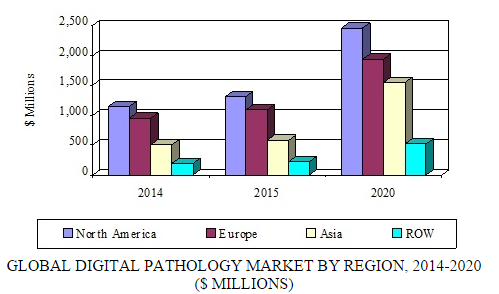 Improvements in operational efficiency, reductions in laboratory expenses, novel treatment options, and better patient care are key factors driving growth of the digital pathology market. Other factors include newer trends in drug development, the rising prevalence of cancer, growth of companion diagnostics, and easier access to physician consultation. However, a few key concerns may hinder market growth. These include FDA regulations in some regions, technological problems, the prohibitive cost of digital pathology systems, and the continued conservative outlook of pathologists. The DPA is a nonprofit group of scientists, pathologists, technologists, and representatives from industry that aims to facilitate education and awareness of digital pathology applications in healthcare and the life sciences. Omnyx already has products that are approved for clinical use in Europe, Canada, and the Middle East. The DPA’s announcement, which suggests that the US FDA will play ball, provides an infusion of renewed optimism to developers of digital pathology systems. Digital Pathology: Technologies and Global Markets examines the field by segments and geography, analyzing trends and opportunities in major regions including North America, Europe, Asia, and the rest of the world. Data from 2014, estimates for 2015, and projections of CAGRs through 2020 are provided.